"Yummy and easy shells, stuffed with garlic, thyme, mushrooms, and spinach ricotta. Perfect for a weeknight dinner! Add more cheese or any kind of meat! A lamb/pork mixture is really good; get a nice sear on it and add it to the spinach and mushroom (sans ricotta) maybe some goat cheese? Have fun with it!" Bring a large pot of lightly salted water to a boil. Cook pasta shells in boiling water, stirring occasionally, until cooked through but firm to the bite, about 8 minutes; drain. Heat olive oil in a large skillet over medium-high heat. Cook and stir mushrooms and garlic in hot oil until mushrooms are soft, about 7 minutes. Stir spinach and thyme into the mushroom mixture; season with salt and pepper. Cook and stir the mixture until the spinach wilts. Remove the skillet from heat and drain any excess liquid; transfer drained mixture to a large bowl. 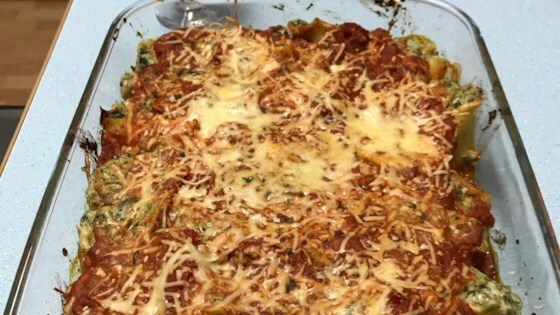 Mix ricotta cheese, 3/4 cup mozzarella cheese, and 1/2 cup Parmesan cheese with the spinach mixture; season again with salt and pepper and stuff into pasta shells. Arrange stuffed shells into a 9x11-inch baking dish. Pour pasta sauce over the shells; top with 1/4 cup mozzarella cheese and 1/4 cup Parmesan cheese. Bake in preheated oven until the cheese is melted and the shells are hot, about 30 minutes. With the spices we added an easy 5 stars. Added fresh garlic and onion--I sauteed them for a minute and then added the carrot, mushies and spinach. Everyone loved it. Thanks! Awesome taste! Can substitute ricotta cheese for 2 % cottage cheese and then drain the cottage cheese...excellent flavour. We like substituting nutmeg for the thyme. I really enjoyed this recipe. It was quick and easy to make. I replaced the ricotta cheese with cottage cheese and it was delicious. We will certainly make it again. Great recipe. I've made this dish many times over the past few yrs. I like to add a little fresh basil, Some cinnamon, and crushed red pepper flakes to the filling.